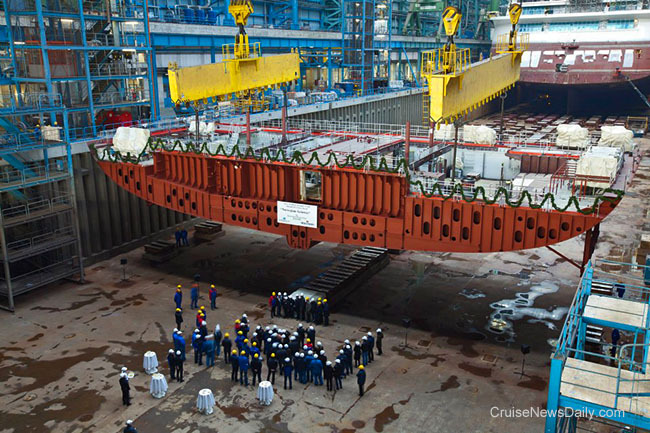 Construction began on Norwegian Getaway on Tuesday (October 30, 2012) at the Meyer shipyard in Papenburg (Germany) when a crane lowered the first 530-ton block of the ship's keel into the yard's massive covered dry dock. It will be the first of 73 blocks that comprise the 146,600-gross registered ton vessel. The crane lowered the block onto a "lucky coin" (below) that was struck for the occasion. 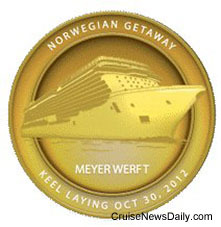 Norwegian Getaway will enter service on February 1, 2014 and be home ported at Miami.